Lake County, Calif. (KGO) -- Firefighters are battling a wildfire on Peterson Lane at Abode Creek in the Kelseyville area of Lake County. 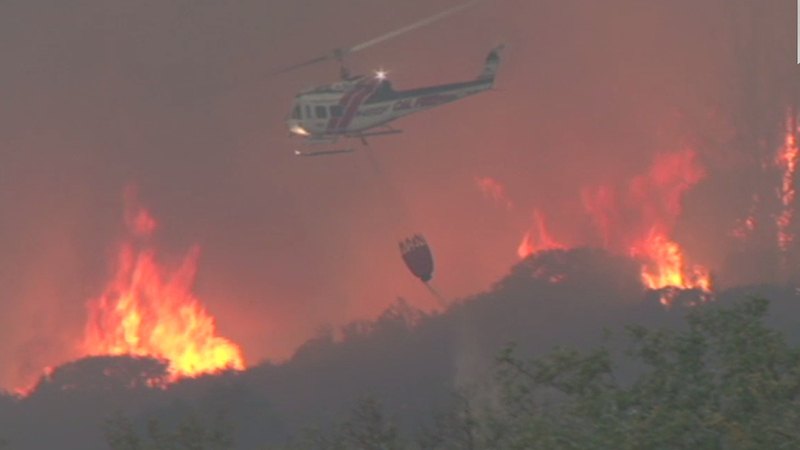 Cal Fire says the fire has spread to 400 acres and burning at a "dangerous rate of spread." The fire is zero percent contained. 210 fire personnel fighting 400 acre #PetersonFire in Kelseyville are of Lake County. Structures threatened. Additional resources enroute. The fire began after 5 p.m. on Saturday evening. Some structures are threatened, but no evacuations have been put in place. Air resources and ground crews are on scene with additional resources the way. There is 50 fire personnel, 10 inmates, 12 engines, and 6 bulldozers working to put out the 400 acre Peterson wild fire.